Hassle! !I cant get this app!! Use FBReader on Android. 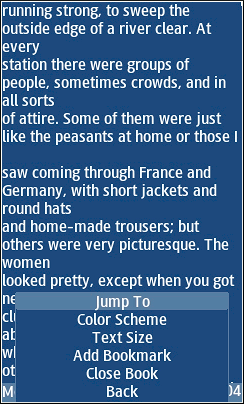 It’s a much better text file viewer and eBook Reader than MTextReader. You can find FBReader in the Play Store. Works on samsung rugby 4 SM-B780A and nokia asha 302. It is limited to txt format, and will not open epub or pdf files – so I use Albite reader for those. can i have that app how? what is the JAD/JAR URL of this app? i can’t find it. what will I do den?? Be sure your phone supports Java ME. If it does and one app doesn’t work try a different one. Not all apps work with all phones. I’ve been trying but still not working….. The apps on this site are not for Android. Sir, I badly need a html file viewer/reader app. Seems to work well on Nokia Asha 501. Thx, nice app! hallo sir please upload a pdf reader jar or jad file for java enabled phones. I’ve never been able to find one. sir can u please hack green farm 3 touch jad.if yes then it would be very nice. Wow not bad!. It works properly on my N 2700 classic and it has 3 font option. With this i don’t have the problem of using a p.c just to modify my apps 🙂 thanks! i appreciate it! To get replies emailed to you check the box labeled “Notify me of followup comments via e-mail” when you leave a comment. Not all apps work on every phone. If one app doesn’t work on your phone try a different app. Sir but if i want use same messanger in my java nokiac200 .is it possible ? If ”no” then please sir can you do this sir? This is app is an eBook Reader not a messenger. It will probably work on your Nokia. Try it and see. Facebook Messenger is already in the Android Play Store and iPhone App Store.